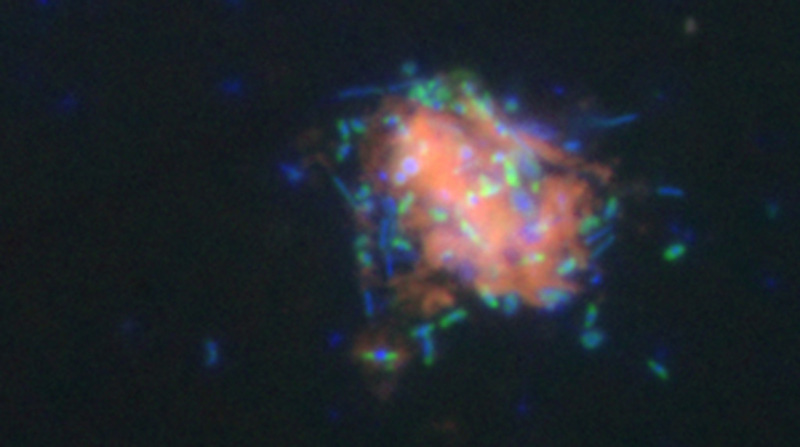 An epifluorescence microphotograph of a bacterial community feasting on an oil floc (pink). Gammaproteobacteria (green) are a well-studied alkane- and aromatics-degrading bacteria. Other bacteria (blue) thrive in close association with the oil particle and their gammaproteobacterial neighbors. Photo courtesy of Luke McKay, Montana State University. Researchers analyzed bacterial communities exposed to Deepwater Horizon oil and identified taxa and genes associated with oil degradation and assimilation. The scientists found that Marinobacter and Alcanivorax dominated alkane-degrading communities, while Alteromonadales, Oceanospirillales, and Rhodospirillales dominated polycyclic aromatic hydrocarbon (PAH)-degrading communities. Oil-degrading bacteria exhibited genes associated with motility and nutrient uptake needed for nutrient-limiting conditions that are characteristic of oil-induced bacterial blooms. These results suggest that the degradation of oil associated with a spill requires the coordinated response of a complex bacterial community. The researchers published their findings in Nature Microbiology: Reconstructing metabolic pathways of hydrocarbon-degrading bacteria from the Deepwater Horizon oil spill. Previous studies correlated observed shifts in microbial community structures with degradation and use of Deepwater Horizon hydrocarbons. However, the genetic potential and taxon-specific metabolisms of these hydrocarbon-degrading bacterial communities are still under investigation. This study’s researchers addressed this information gap by reconstructing draft genomes of enriched marine bacteria collected in oil-contaminated sea surface and deep plume waters in May 2010. The researchers incubated bacteria from oil-contaminated water samples with 13C-labelled alkane (n-hexadecane) and PAHs (phenanthrene and naphthalene), and the bacteria incorporated these 13C-labelled hydrocarbons into their DNA. The team separated the resulting 13C-enriched DNA from the non-labelled DNA pool and used them to reconstruct the genomes of individual hydrocarbon-assimilating community members and to build metabolic models that traced the physiological pathways involved in oil degradation. Comparisons of model output with published plume-derived metagenomics and metatranscriptomic data sets shows that the reconstructed lineages resembled those of bacteria found in hydrocarbon-contaminated waters. Researchers identified and reconstructed the versatile alkane-degrading bacterium Marinobacter and reconstructed its entire pathway for degrading alkanes from the metagenome. The alkane-oxidizing bacterium Alcanivorax occurred not only in hexadecane but also in in naphthalene enrichments, suggesting they have the ability to degrade both components, potentially by participating in bacterial consortia that fully metabolize PAHs. All assembled genomes possessed pathways for degrading alkanes and PAHs, suggesting that several taxa degraded hydrocarbons during the spill. Bacteria not typically associated with PAH degradation persisted at sufficiently high levels for metagenomic reconstruction. Data are publicly available through the Gulf of Mexico Research Initiative Information & Data Cooperative (GRIIDC) at doi:10.7266/N7GH9FZ8. The study’s authors are Nina Dombrowski, John A. Donaho, Tony Gutierrez, Kiley W. Seitz, Andreas P. Teske, and Brett J. Baker. This research was made possible in part by a grant from the Gulf of Mexico Research Initiative (GoMRI) to the Ecosystem Impacts of Oil and Gas Inputs to the Gulf-2 (ECOGIG-2) consortium. Other funding cources included the Marie Curie International Outgoing Fellowship (PIOF-GA-2008-220129) and the National Science Foundation (NSF-OCE 1045115).